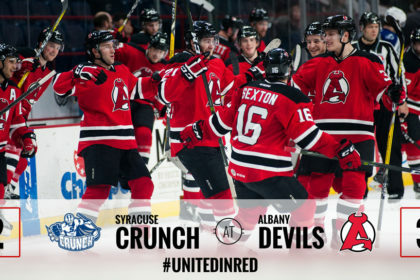 ALBANY, NY — The Albany Devils defeated the Syracuse Crunch 3-2 in overtime Wednesday when Kevin Rooney scored the game winning goal 1:17 into the extra period. 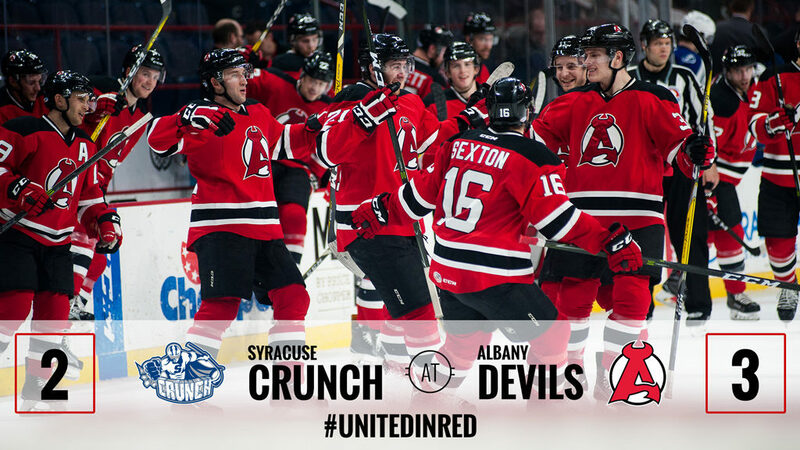 Albany improves to 23-15-1-1 while Syracuse moves to 20-10-3-5. 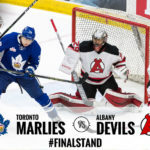 Jacob MacDonald fed Rooney in stride for a tip-in goal to give the Devils their second straight victory. 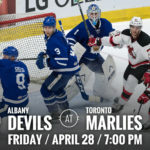 The goal was Rooney’s eighth of the season and the assist was MacDonald’s third point as a Devil. Ben Sexton registered the second assist. Yanni Gourde put the Crunch on the board at 10:47 of the third period to break Ken Appleby’s shutout bid. Tanner Richard followed up with the tying goal at 13:17 which sent the game into extra time. 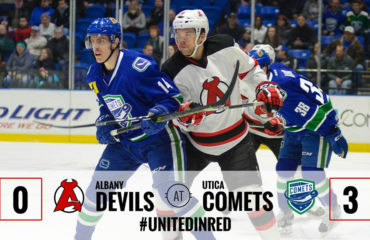 Ryan Kujawinski netted his second goal of the season at 6:04 of the first period to open up the scoring for the Devils. Carter Camper found an open Kujawinski on a wrap-around after receiving a pass from Sexton. 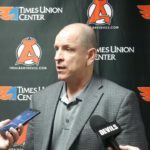 With two assist, Sexton now has 11 points in his last ten games (8g, 3a). After a scoreless second period, Vojtech Mozik found the back of the net at 12:48 of the third period for his fourth goal of the season. Mozik lined up a one-timer from the top of the left faceoff circle and rung one off of the corner of the pipe for the power-play tally. 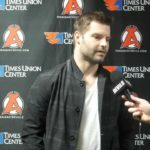 Reece Scarlett and Brian Gibbons had the assists. 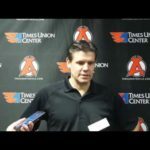 Appleby stood on his head as he stopped 29 of 31 shots for Albany while Adam Wilcox made 23 saves on 26 shots for Syracuse. 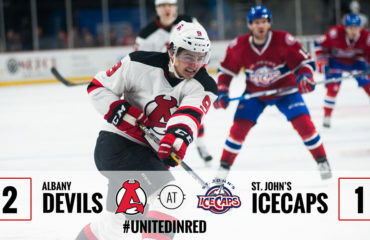 The Devils travel to St. John’s Saturday for the first of two against the IceCaps this weekend. 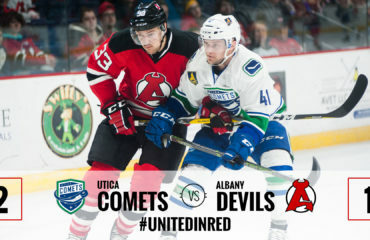 Puck drops at 2:30 pm Eastern Time.